Gunga Jim and Vicar join our toothy pal on this week's cover for a spot of bridal banter, not to mention marital mirth. The third instalment (of four) of the Giant Cheeky poster occupies the centre pages this week, but there's no mention of it on the front page, the editor probably judging that no-one who missed the first two sections is likely to come aboard now for the sake of half a poster (even though all they have missed to date is Cheeky's lower regions). I'm sure you're fed up with my complaints when 6 Million Dollar Gran is described as bionic despite it having been made clear in the first episode that she's a robot, but I'm afraid it's happened again in the banner at the top of the cover (for more about this banner see here). The lower banner promises that the comic will lift the spirits of those of a morose disposition, so let's head inside for some fun. 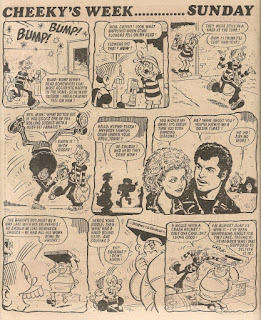 Mike Lacey illustrates Cheeky's traditional Sunday paper round, including an encounter with Olivia Newton-John and John Travolta (singles lifted from the Grease soundtrack and performed by the pair had furnished the second and third most popular singles in the UK charts of 1978), although the dance-based gag suggests the scriptwriter maybe confusing Grease with Saturday Night Fever (the source of the fourth most popular single of '78). This week Charlie decides to use his own initiative rather than rely on Calculator's advice. Young master Counter's prescient pal indulges this misguided venture, before saving the day with typical electronic aplomb. Meanwhile, Stage School teacher is rather liberal with the physical chastisement. Pages 8 and 9 see the second and final Cheeky Weekly outing of the Green Cross Man's 'Football Crazy' guide to safely negotiating Britain's busy roads. In the centre pages is the aforementioned third instalment of the Cheeky poster. Some casual readers may have decided, on the assumption that the final section would feature our mirthful mate's ugly mug, to put off purchasing the comic until part 4 of the poster is published. However, any such money-saving strategies have been foiled as, on our gradual ascent of the toothy funster, we have now reached his chest-to-jaw area. Those putting off the purchase until the final week will find they have only the upper half of Cheeky's face to adorn their bedroom walls. The Wednesday page is the scene of another final appearance, as we say farewell to Posh Claude's mum. 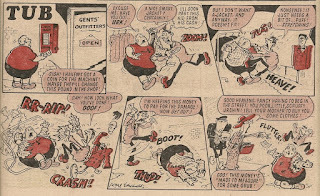 There's further rear-end roughing-up in Tub's story, where our portly pal is assailed by a malevolent merchant of menswear. 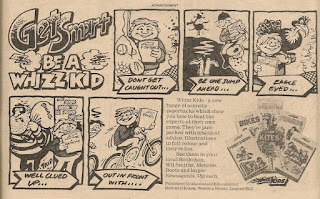 Page 29 is the site of an advert for Whizz Kids, but this is not a plug for the front section of IPC's long-running 2-comics-in-one, it's an ad for a series of instructional paperbacks. Cheeky is up early on Saturday as he takes on an additional newspaper round, during the course of which he meets avid TV viewer Square-Eyes. Their gag is based on the unlikely premise of breakfast-time TV. As if that will ever happen! Snail of the Century again brings the comic to a close. Mike Lacey delivers 8 Cheeky's Week elements this issue, with Frank McDiarmid supplying only the front cover. Eight weeks after the humiliating events recorded here, which heroic ex-Cheeky Weekly star embarked on an audacious revenge sortie into the pages of Whizzer? Read the following strip (including a character depiction that would be considered inappropriate today), then scroll down for the answer. 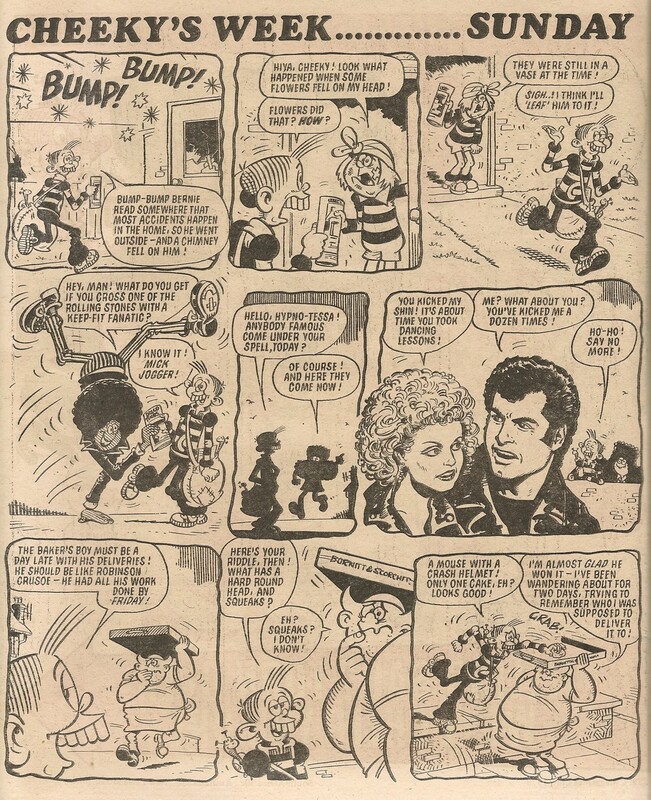 Mustapha first infiltrated Steve's story when he was given the honour of making the inaugural Chip-ite raid of Whizzer and Chips' post-Whoopee-merge era, back in April 1985. By this stage those wastrel Whizz-kids had mounted 12 raids on ex-Cheeky stars while our plucky pals had penetrated Whizzer on 7 occasions. As Jackie The Musical begins its tour, surely it can't be long before our favourite comic makes the transition into other artistic realms. Personally, I see it as a film rather than a stage production, and certainly not an animation - I envisage that the likeness of the characters could be achieved with suitable costumes and prosthetics. The script would of course be by Willie Cook, and Frank McDiarmid would be artistic director. Here's my suggestion for the actors who would portray the toothy funster and his pals. I'm struggling to cast Lily Pop - any suggestions? In this series of Rejects posts I'm examining the named characters who appeared in Cheeky's strips in Krazy but failed to make a transition into Cheeky Weekly. Attention turns this time to the rather curiously-surnamed April Apron. 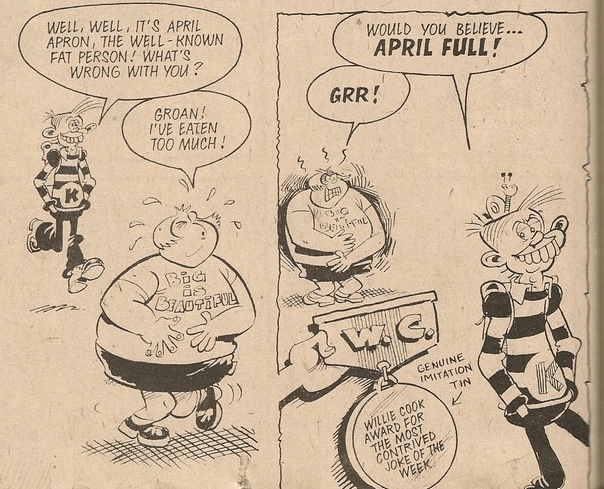 April turned up in the 1977 April Fool edition of Krazy (cover date 02 April 1977). It's not surprising that April never migrated to Cheeky Weekly since she was very much a single-gag creation. 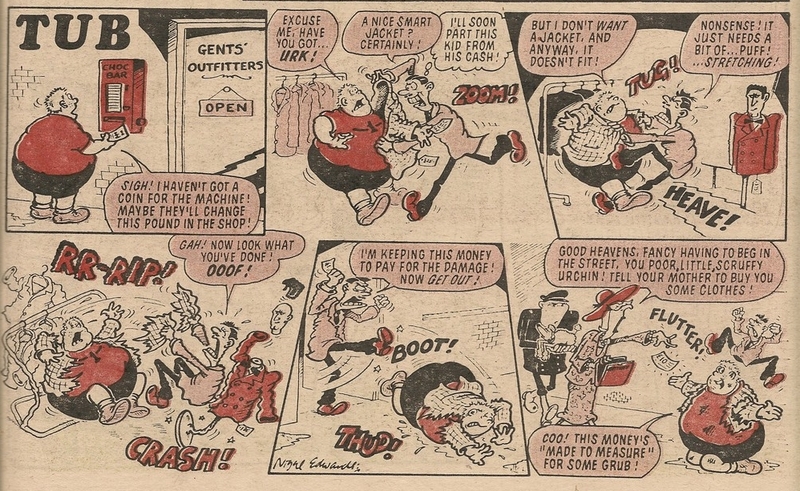 Even the Cook/McDiarmid team behind the Krazy strip above had to admit to the somewhat strained nature of the joke associated with the character. 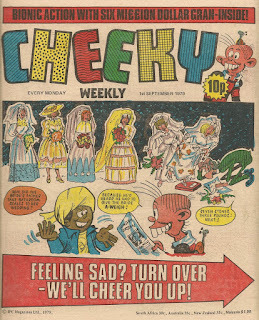 The cinematic shenanigans of Home Movie occupied page 22 of the first two issues of Cheeky Weekly, but the filmic fun was supplanted the following week by Mustapha Million, who retained his hold on the subject page for 13 weeks. However, our middle eastern mate wasn't absent for long, because after a single appearance of the Friday element of Cheeky's Week, Mustapha was back for a marathon 17-issue run, which was again interrupted by Friday for a single week. Mustapha's sure grip on page 22 appeared to be slipping by this point as his return was for a mere 2 weeks, after which the gag-evaluating panel of Joke-Box Jury turned up to deliberate on the latest selection of readers' funnies in the issue dated 01 July 1978. For the next three weeks, page 22 was home to a selection of ads, the majority of which were focused on the imminent summer holidays. 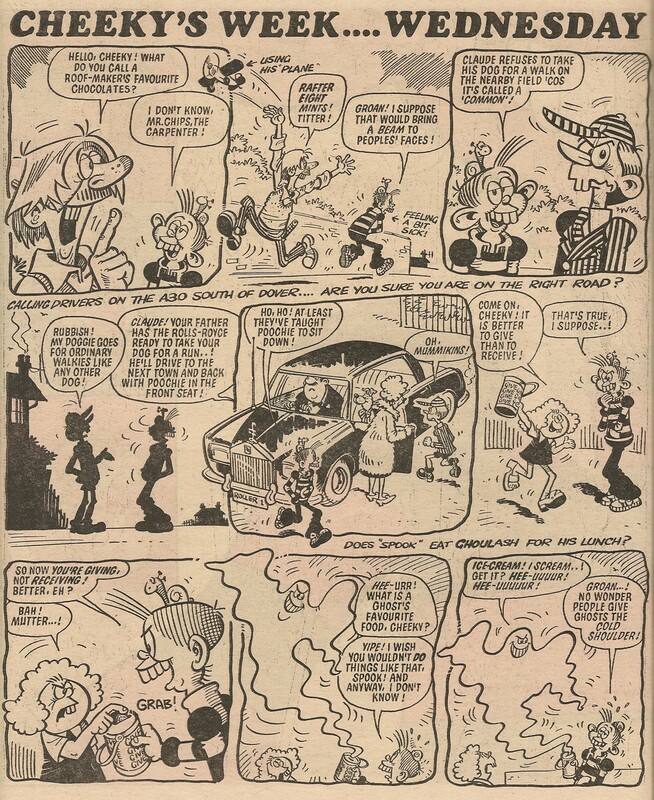 Toy manufacturer Peter Pan Playthings were advertising a range of products suited to recreational use outdoors (the same toys were offered as prizes in a competition in the toothy funster's comic dated 22 July 1978). Birds Eye were no doubt hoping that a scorching summer would shift plenty of their mousses (moussi? ), while the Cheeky Summer Special could be enjoyed whatever the meteorological conditions. 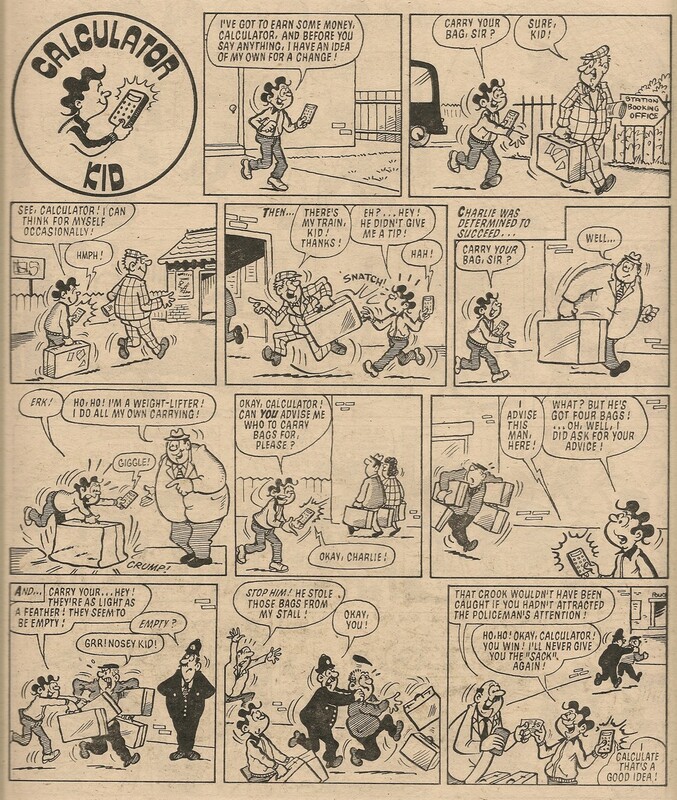 Joke-Box Jury then resumed occupation for one week, being displaced by the final episode of Old Comic which chose to bow out with a Champ strip from Whizzer and Chips. The competitive comedians of Joke-Box Jury then retook possession for one week before our moneyed mate Mustapha moved back for 2 issues. 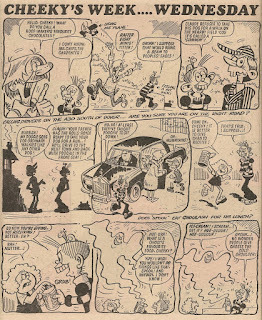 Jokes were again on page 22 in the 23 September 1978 comic, but rather than the Joke-Box Jury panel, it was the final part of the cut-out-and-play Crack-A-Joke game that came to rest on page 22. Calculator Kid then resumed for 3 weeks This was to be Charlie and Calc's final page 22 run, bringing to 9 the number of appearances they made in that location and making Calculator Kid the third most regular page 22 occupant. 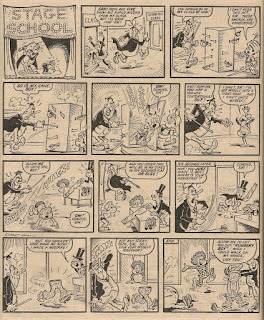 Saturday appeared on page 22 in the edition dated 02 December 1978 (the first of 2 consecutive issues which had 28 pages - instead of the usual 32 - due to an industrial dispute). In the second truncated issue, the final Laugh and Learn feature occupied the page under review. Following these 2 shortened editions, industrial relations evidently worsened, as the comic wasn't published for 3 weeks. 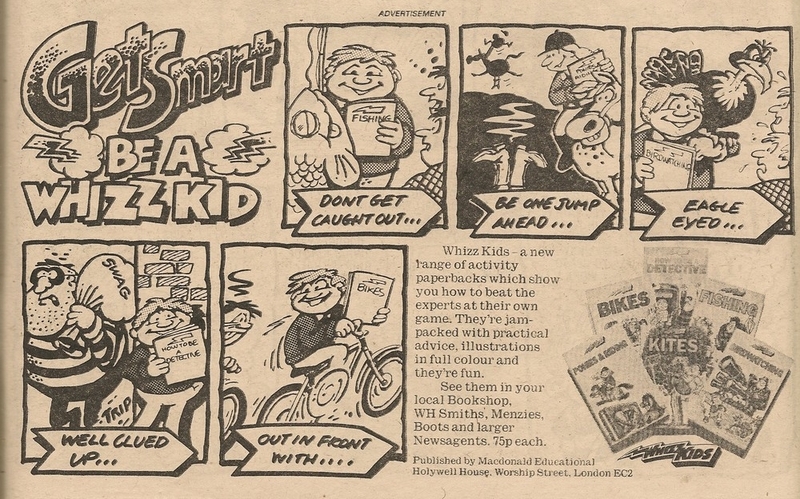 Cheeky Weekly returned to the newsagents' shelves with a full-size, 'standby' issue dated 06 January 1979, in which Skateboard Squad's adventure appeared on page 22. 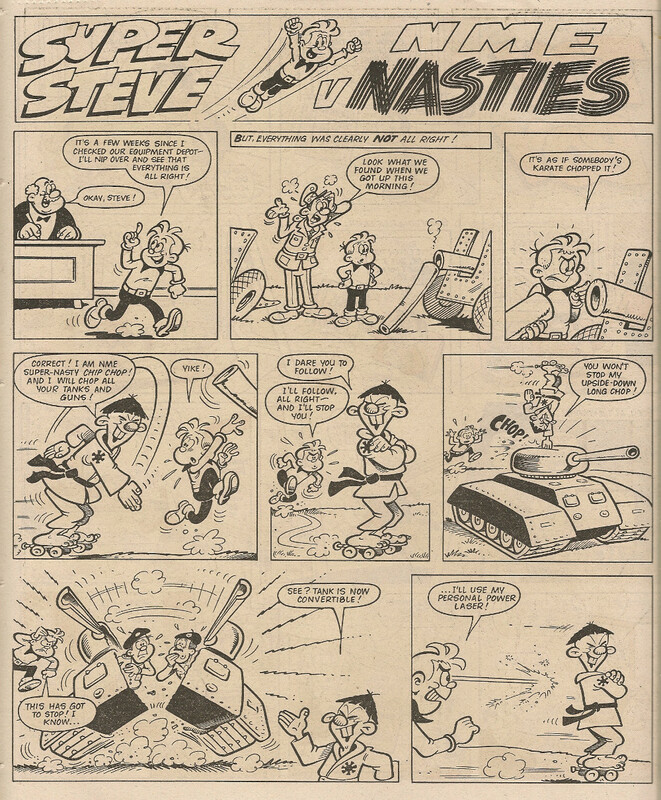 Cheeky's Saturday outings to the cinema had come to an end in the 02 December 1978 issue, and the resulting reorganisation of the comic's contents meant that the toothy funster's Thursday page was shunted forward to page 22 in the editions cover-dated 13 January to 03 February 1979. The What's New Kids advertising feature then moved in for a week, following which Skateboard Squad made a return visit to the location under review, but their last under the strip's original title. For the next 2 issues Thursday moved back in, before the lucky winners of The Saint competition (or should that be the The Saint competition?) 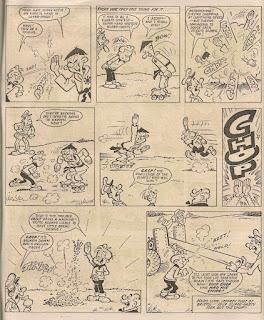 were listed on page 22 in the comic dated 24 March 1979. ...following which the witticisms of Joke-Box Jury enjoyed a further 2-week page 22 sojourn. Cut-out booklet 'The Cheeky Spotter Book of Town and Around' then moved in for a week, after which Thursday returned before being ousted after one appearance by the return of the Spotter Book, for its final instalment. 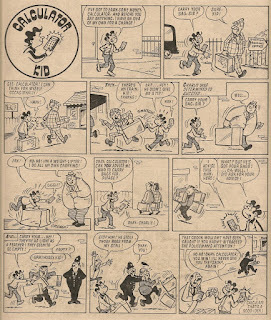 Thursday then returned for an 11 -week stint, before being usurped in the 22 September 1979 issue by a surprise appearance of Wednesday, which was unceremoniously shoved towards the rear pages by a Joke-Box Jury double-pager earlier in the comic. A week later Thursday began its valedictory page 22 run, spending 5 weeks culminating in the 27 October 1979 edition and bringing Thursday's total page 22 outings to 24, making it the second most regular feature to appear on the subject page. In the following issue page 22 was home to the final outing of short-lived filler feature Tease Break. Why, Dad, Why? made its only page 22 appearance a week later, following which Joke-Box Jury moved back for one issue before being deposed in the edition dated 24 November 1979 by an ad placed by Peter Pan Playthings, who were on this occasion keen to impress that their Superdraw, Clobber or Snoopy Mighty Model Maker games would make mighty fine additions to readers' Christmas lists. 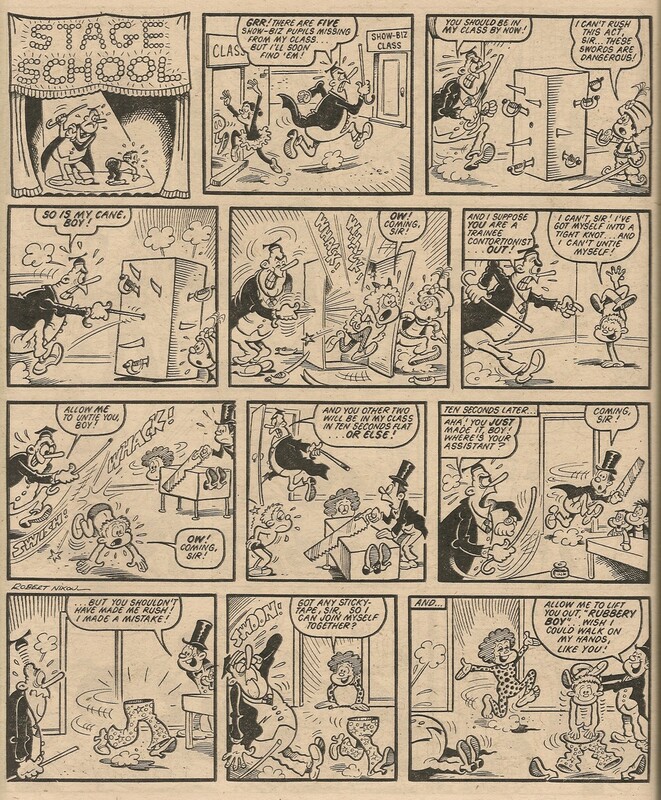 The jesters and judges of Joke-Box Jury were then back for a week, after which, in the 08 December edition, Peter Pan Playthings made their final bid to increase Christmas sales by re-running the same ad from two weeks earlier. The following 2 weeks saw Joke-Box Jury return to page 22, bringing to an end its run in this location. The following issue, dated 29 December 1979 saw two IPC ads sharing the page under review; Shoot's Christmas 'Big Double Issue' was in the shops that week, while the following week's issue of Penny would include the first part of an 'Engagements Calendar'. This was the last time page 22 would host advertising. 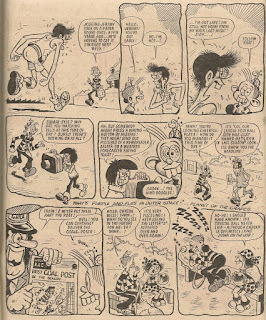 Paddywack, Elephant on the Run, Speed Squad and The Gang would be the respective page 22 occupants in the next four issues, each of whose visits was their sole time in that location. Our prosperous pal Mustapha Million was featured on page 22 in the last Cheeky Weekly dated 02 February 1980. This brought to 35 the total times the affable Arab had fetched up on page 22, making Mustapha the most regular inhabitant of the site under examination.